Yesterday was Rheumatic Disease Awareness Day, #rheumday, sponsored by The Rheumatic Patient Association. Even though I’m very public with my health status, because my diseases are invisible, many people are not aware of my struggles. Rheumatoid arthritis is something I’ve been living with since I was a teen even though my ‘official’ diagnosis was relatively recent. After the birth of my second son, my health really crashed and I started seeing a lot of doctors. All I really knew for certain was I used to shoe horses, move tons of hay, exercise regularly, and I’d hit a brick wall. Anything more than a mellow walk sent me into disabling migraines. I’d been a member of my local Y for several years but I was reduced to a gentle walk on the treadmill. When I got my lupus diagnosis, I thought that was it. I was never going to get off that treadmill, and life as I knew it, was over for me. Fast forward 5 years later and my health is in a much better place through medication, lifestyle changes, and effort. I now work at the Y that supported me through that dark time. I’m really proud to work at the Y that helped me get my health back. Teaching deep water aerobics yesterday, I played this song called Chico Gospel by MaMuse. It’s a personal song for me since I first heard it when I was getting back on my feet. I am proud to work at the Y. Because of them I am walking on this earth stronger than ever! Find a Y near you. They’ve got a dedicated team, many of whom have their own stories of recovery. If you live in Pinellas County and want to join me or another staff member at the Jim & Heather Gills Y, check their website, HERE. Live is not over for you either! Support an Indie band by buying music off their website from CD baby. Listen to this song, Chico Gospel, off the album All the Way on MaMuse’s website. If you need yoga tips for managing your arthritis, read my page, yoga for arthritis and autoimmune diseases. 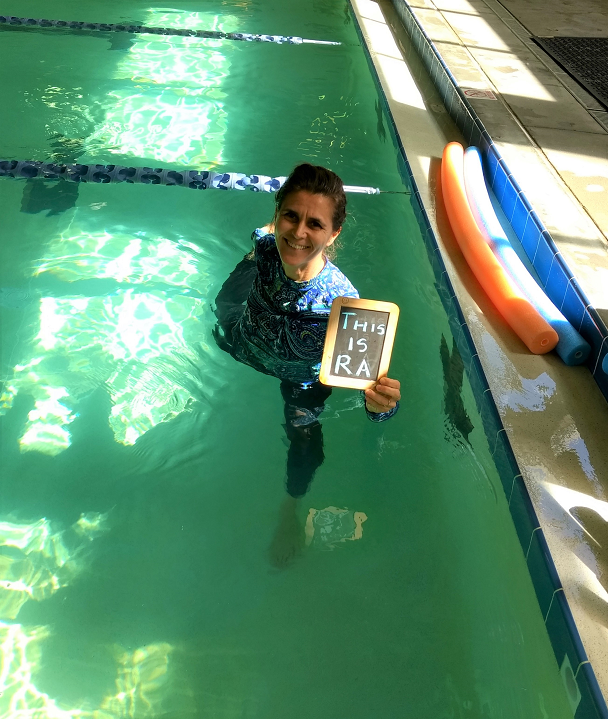 If you want to thrive with yoga despite chronic illness too, sign up for my email list to get my free aqua yoga for lupus sequence.